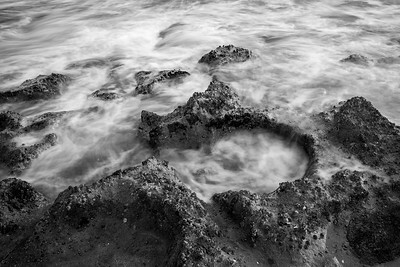 A rising tide fillsthe holes in a well worn beach rock outcrop. 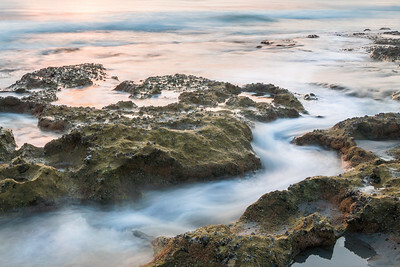 Rising tide carves an "s" curve through the rocks on this morning. One of the few rock outcroppings on a Boca Raton, FL beach. 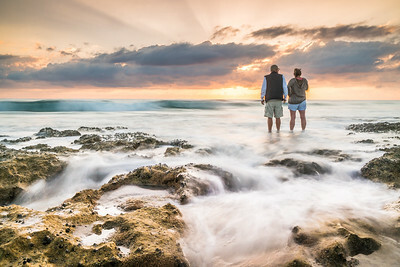 As I awaited the sunrise beachgoers decided to join the scene in front of my camera. 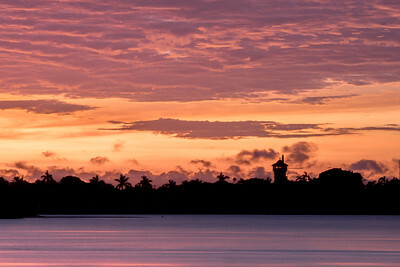 That's okay, many more sunrises to come and I'll share this one with many others. 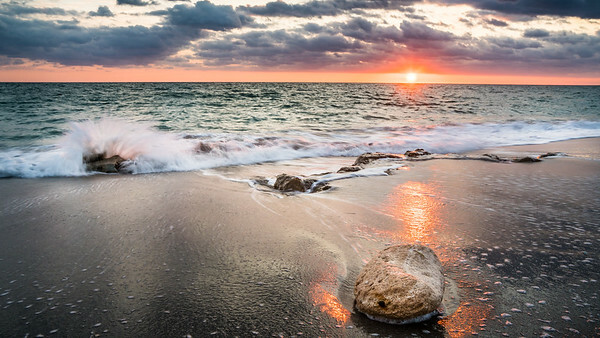 Inviting coquina rock outcrop traverses the sand to the ocean with rising sun beyond. The grounds of the historic Pinewood estate home adjacent to the Bok Tower Gardens in Lake Wales, Fl. At Christmas time each year the home is decorated in a traditional Christmas theme. 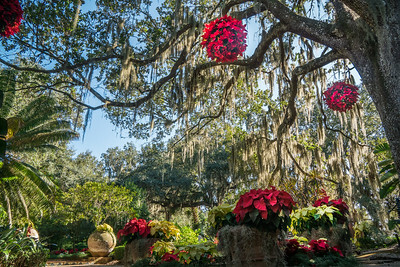 The large Live Oak at it's entrance is adorned with large Poinsettia balls as if ornaments on a Christmas tree, Florida style! 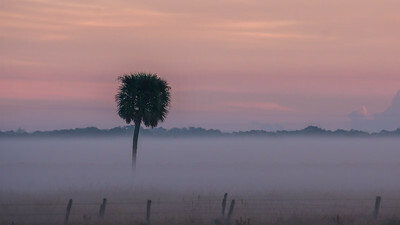 A dirt country road transits an old Florida landscape into the early morning. Stars still visible with a hint of the rising sun in the clouds. 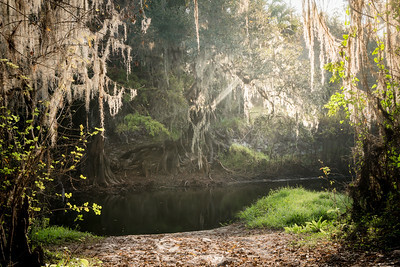 Fort Center/Fisheating Creek WMA, FL. 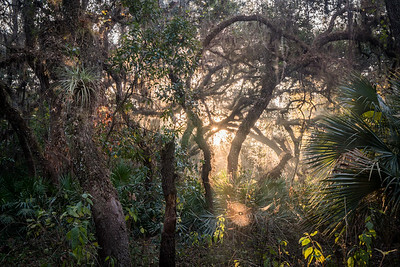 The trails in this Florida wildlife management area meander through an ancient forest of oaks, palmetto, wild coffee and many varieties of wild citrus. 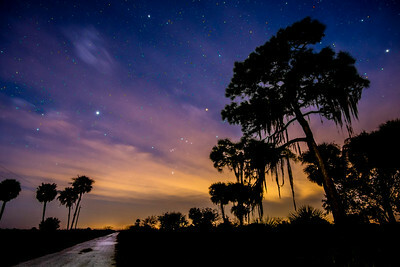 Just off the trails are ancient native American earthworks, some of the earliest known in Florida. On this January day the citrus trees were loaded and the like aroma filled the air. 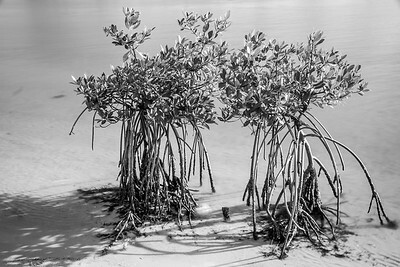 Black and White of two young Mangroves. These were transplants along the shoreline in the Hobe Sound National Refuge. The small encrusted pipe in between the two was where a sibling was also once planted but did not do as well as it's friends. 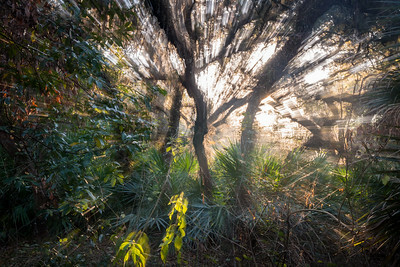 A very large dead Slash Pine stands in the Hobe Sound National Wildlife Refuge. 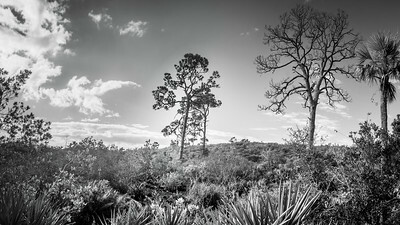 Slash Pines were once common in the landscapes of South Florida. However, over the last 30yrs a non-native pine beetle has decimated them. The two seemingly healthy ones nearby may soon meet the same fate-changing the landscape in this location forever. Only the roots remain of this once large tree along the shoreline. Some roots are still holding tight under the water. Most of the fog had burned off in the field this early morning. 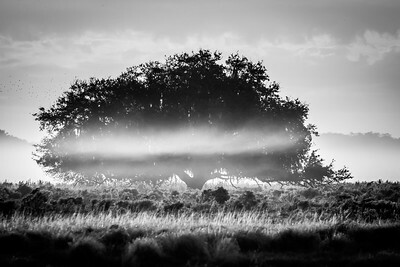 However, the air in the shadow of this oak was still cool and misty. 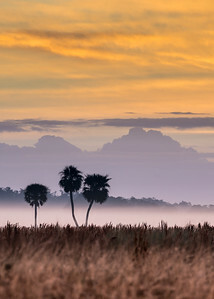 Three Cabbage Palms on a large open Florida cattle ranch. The sun is rising as distant thunderstorms approach. 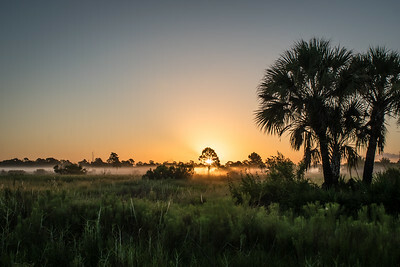 The sun rising on a clear morning, highlighting a Florida Slash Pine in the distance. 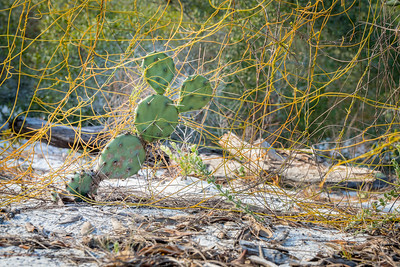 A lone cactus far away from the parks in it's own park, Hobe Sound National Wildlife Refuge. 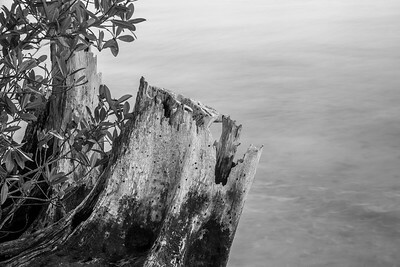 Old sun bleached stump along the Loxahatchee River in Jupiter FL. Framed by a veil of moss this is certainly the perfect place to launch a canoe or kayak near the headwaters of the Peace River. 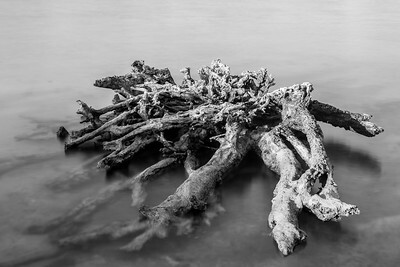 Low water levels reveal most of a majestic oak tree roots beyond the black river water. A picture is worth a thousand words but this photo does not do this tree justice. 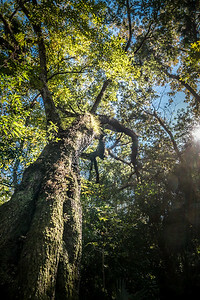 The trunk of the ancient oak is gnarled with age along with scars from forest fires from the distant past. Resurrection ferns and various air plants adorn their gracious old host as it bathes in the late afternoon sun. 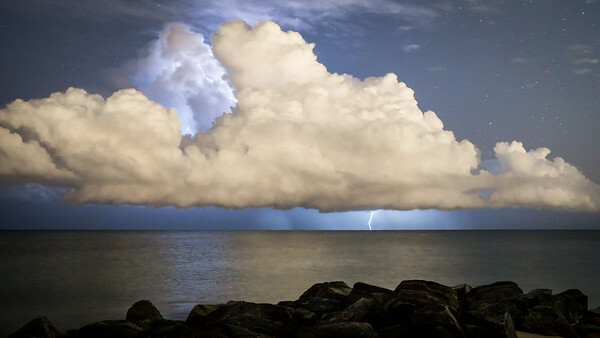 An early morning thunderstorm over the Atlantic Ocean. Clouds are illuminated by the brightness of the highly populous South Florida area. Stars can be seen in the darkness beyond. An unusual, single rounded coquina stone loose on a Town of Jupiter, Florida beach. Larger coquina rock formations closer to the water take the brunt of a rising tide and waves on this morning. 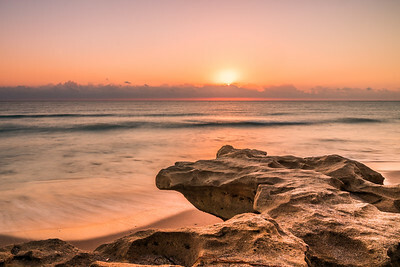 Coquina rock formation under the glow of a progressing South Florida sunrise. 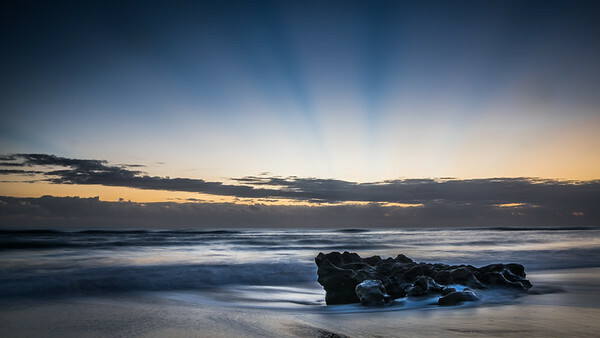 Sunrays can be seen as the tops of clouds cut off the first light of the rising sun.